I get a lot of questions from authors about WHEN they should complete certain book marketing tasks. While so much of this depends on your personal goals and whether or not you're with a big publishing house, a small press, or going it alone, this is a general guideline that you can follow. Don't hesitate to email me if you need clarity or could use some help with any of these tasks! Narrow in on your target audience. This will help you as you create marketing plans (and may even help guide you as write your book... added bonus!). Set up new social media accounts and/or make sure update your bios on accounts you've already set up to include the new book. Start thinking about your social media personality: what, other than your family and what you had for breakfast, do you want to be posting about? Are you an activist? An art lover? A musician? Share the best parts of yourself with others, and you'll make strong, authentic connections on social media. List out your assets (videos, audio recordings, drawings, photographs, etc. ), media connections, and the "hooks" you'll use to sell your book to reviewers and consumers. Who will you contact for reviews? Who will you contact for interviews? What local media can you reach out to? Look up any local or national book fairs or festivals and make your travel plans. Prepare and practice a quick "elevator pitch" — you'll want to be able to describe your book in about 30 seconds to people you come into contact with at networking events or in actual elevators. Do a photo shoot! Hire a photographer for a few hours to get you at your desk, or at work, or doing what you love. The photos will be very useful for your social media, website, and press/publicity. Start sending out your media pitches. Reach out to podcasts that are on-theme with your book to introduce yourself and see if there's an opportunity to do an interview or be a guest on the program. Your cover should be finalized by now. Request a high resolution file and a 3d mockup from the designer so you can use these in your marketing images. Start sending out physical advanced review copies as soon as they're ready. Pull content from your book, quotes, ideas, excerpts, etc. Make a schedule of posts and start sharing. You don't need to link to your book every time you share. Think of social media as a cocktail party. If you're trying to close a business deal and get a sale with each conversation, you're doing it wrong. You want to create relationships and invite people in to your world. Send out digital advanced review copies to more potential reviewers. Create images and animations for social media. These can be quotes, early reviews, and certainly use your assets from the book. If you use a scheduling tool like Hootsuite, you can schedule these in advance. Get your marketing and launch calendar set! You'll want a written plan of everything to come. Start "like" ads to attract new fans to your work. Create an advertising plan around your marketing and launch calendar, making sure to promote your events and advertise your most compelling content. Consider how much of a preorder campaign you'd like to do. Often successful authors offer free bonuses when people preorder, like an extra printable page or story, or a chance to enter a giveaway. Other preorder engagement campaigns could include quizzes, videos, or challenges. It's go time! You should be posting on social media every day, sometimes more than once per day when possible. TEST your social media channels to see which accounts get the most attention and the best results. Test advertisements as well to see where you're getting the best return on your investment. Share your longer-form assets, like excerpts, Q&A's, videos, etc. Start your advertising plan, to boost what's working! You have time now to rework what's not working, so if any of your content is falling flat or not getting attention, take another look at it and see if there's a way you can re-work it to try again. This is your prime preorder campaign window. If you've got a preorder campaign, stick to the plan and promote your offers in a consistent and clear way. Keep up the posting and sharing! Join and comment in book lovers' and writers' forums — there are tons on Facebook and on the web. Don't spam, just spend a few minutes a day being authentically interested in what other people are writing and working on, and when you get reviews or exciting things happen, share them with humility. Remember, people who are in forums LOVE and TALK books all day! They can help you spread the word. Share early reviews with email subscribers, your inner circle, and on social media. Email your friends and family and "inner circle" personally and directly to ask for them to: share your book with their friends, reach out to their local library and local indie bookstore, preorder your book on Amazon or Barnes & Noble. *This is worth it! Take the time to send the personal messages, and it will pay off. Preorder blitz time! The preorders you get now can help you achieve bestseller status on your on-sale date in your category on bookseller sites or in bestseller lists like the New York Times or USA Today. Push hard and keep your eyes on the prize. Make sure your advertising budget is getting results. Are you getting email sign-ups if that's your goal? Are you getting Facebook Messenger subscribers? This is a great time to tweak any messaging or art that's not working. Keep up the preorder promotions! Make any last-minute updates to your Amazon Author page, your Goodreads page, and any other areas. Start asking for and gathering social proof. Add early reviews to your book description on Amazon and bookseller sites. If friends and family have read the book, ask them to please post a review on the on-sale date. Ask your inner circle to send pictures of them with the book. 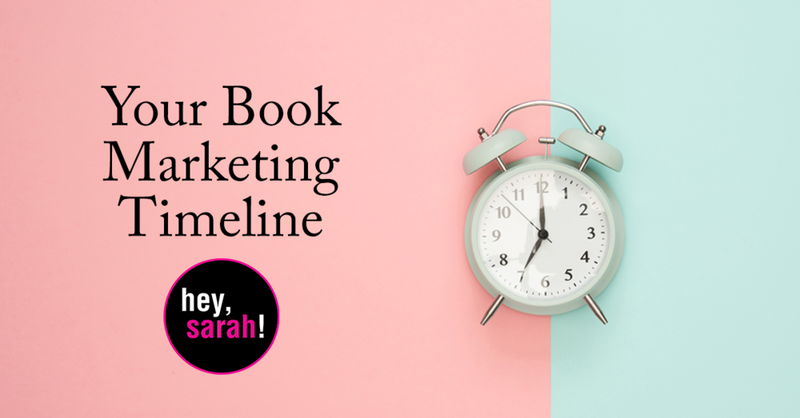 Remind your email list, social media connections, and personal contacts *one more time* that preorders can really help your book be discovered by readers. Tell people how you're feeling! This is an exciting and nerve-wracking time, and letting people know how it feels is an authentic way to connect. Update any calls-to-action on your site from "preorder" to "order." Ask friends and family to post for you. Start sharing pictures of people with the book—this social proof is often what it takes to get people to click over and make the purchase. Start sharing reviews of the book on your social media channels. Keep collecting and sharing that social proof! Continue sending your book out for reviews when you find good potential review matches. Thank the people who helped you and your social media audiences. Apply for notable book awards and contests as you see fit. Keep an eye out for WHAT WORKED BEST on your social media channels. Did one particular picture get the most attention? If so, try boosting it again, or try putting it on different channels. You can also try creating a different image, but with a similar look and feel. Keep your eye out for new potential marketing opportunities. If you can get your book included in a monthly subscription box, or highlighted on a list of recommended reads, etc., it doesn't matter if it's a month after pub date, or a year! A book is a long-term commitment, so find ways to stay fresh and engaged.